The Tecnam P2008. 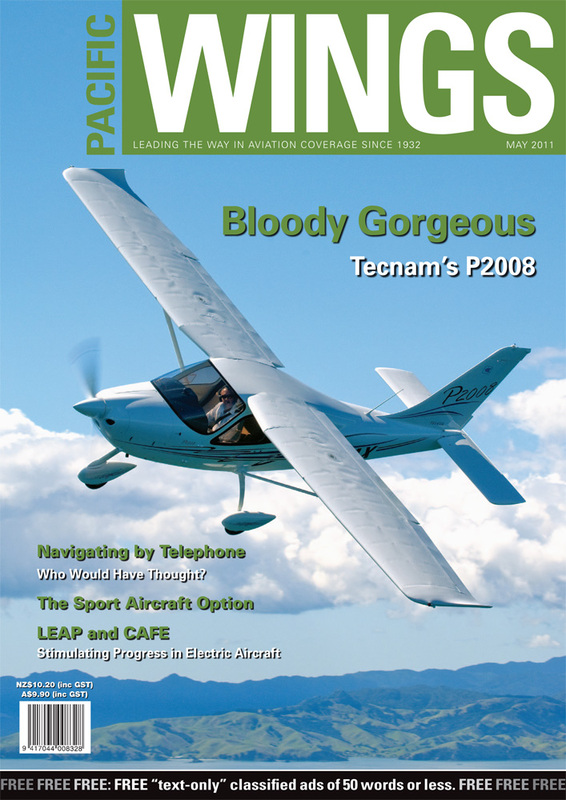 The Tecnam P2008 is the latest and, according to Rob Neil, who flew the P2008 in Auckland recently, definitely the most attractive in a successful line of single engined light aircraft from Tecnam. Jill McCaw reports on the success of her 18-year-old son Alex, who recently became the youngest glider pilot in the world to achieve the FAI’s 1,000km Diploma. Navigating by Telephone—Who Would Have Thought? The advent of “smart phones” has done far more than change the way people communicate. John O’Hara reviews a few iPhone “apps” that make it clear smart phones are changing the ways we fly and travel. John O’Hara summarises some of the benefits of flying light sport aircraft in the increasingly expensive world of general aviation. Mike Friend is a highly qualified aerospace engineer with a passion for electric flight. Mike discusses two programmes designed to advance technology in electric aircraft and details a patented idea of his own for increasing the range of electric light sport aircraft. Don Harward shares his thoughts on lost friends, Memorial Days, political correctness and being an aerial taxi driver for VIPs in a war zone.